This recipe came about by combining two different desserts. The crust comes from a blueberry jamboree that I made for a family BBQ and the lemon part is a combination of ideas. My sister brought home the Magnolia table cookbook which features Joanna Gaine's Lemon pie. I was about to make it but realized it used a good amount of condensed milk and I just wanted to something lighter than that. (And we all know how much I loooove condensed milk) So I went on the hunt for a lighter lemon pie recipe and found a recipe for a sour cream lemon pie. Bingo! It starts out with a pudding like base, flavored with fresh squeezed lemon juice and zest which is then folded in with sour cream. I couldn't resist. I liked that it was a scratch recipe with which I was able to control the amount of sugar in it. I reduced the amount from the original recipe so it still provides a sweetness to mellow out the tart lemon, but isn't cloyingly sweet. The pudding starts out with sugar, corn starch and milk. This gets cooked until it reaches a paste like consistency. Don't be scared, it can go from liquid to paste in a matter of seconds so don't walk away from the pot! To, this goes in egg yolks (tempered of course) and is cooked and whisked till you get a smooth, very very thick mixture. Now it's time for the lemon juice. When first added it will look like the mixture is separating, but keep whisking and it will come together beautifully. Add in the zest and butter and stir to combine. Pour this onto your pecan crust and refrigerate for 3-4 hours or overnight. Top with the fresh whipped cream once it's chilled and enjoy this pie on a hot summers night. Perfect for BBQ's, holidays or just a Tuesday. It's sure to become a family favorite! Melt butter in a pot, add in pecans, sugar and flour. Stir quickly to combine into a dough. Bake for 15-12 minutes. The crust will still look pale and that's ok! Set aside to cool. Place egg yolks in a bowl and lightly beat together. Set aside. In a heavy bottom pot, whisk together the sugar and cornstarch. Add in the milk and whisk to combine. Set the pot on a medium- medium high heat and cook until bubbles form, whisking continuously. Once it bubbles, continue to cook for another 1-2 minutes. It will get very thick and paste-like. Take 1-2 tbsp of the paste and whisk it into the egg yolks. You want to temper the egg yolks so that they don't curdle when you add it to the milk mixture. Once the eggs are tempered, add all of the egg mixture into the mixture and whisk. Cook this for another 2 minutes until it gets very thick. Take the mixture off the heat and whisk in the lemon juice. Once it's combined , add in the lemon zest and butter. Stir to combine. Allow the mixture to cool (I like to set the pot in a bowl of ice and whisk until it cools down) then whisk or fold in the sour cream. Pour the lemon mixture onto the cooled pie crust. Place in the refrigerator for a minimum of 3-4 hours or even better, overnight. Place the heavy cream into the bowl of an electric mixer. Add in the sugar and whip on high until cream is thick and fluffy. 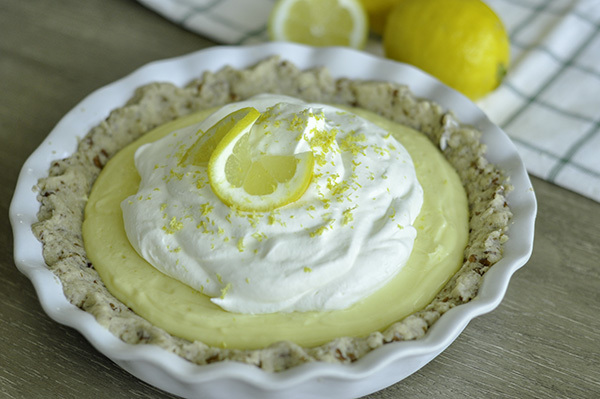 Pile the whipped cream onto the lemon pie and sprinkle of any left over lemon zest!